Since the late 1990s, Cedar River Natural Area has been a protected and quiet place to soak in the natural world, from wildlife to wildflowers. Some of its trails have been there even longer but who knew? Managed by the Antrim Conservation District, officials readily admit that the preserve, located on the doorstep of Bellaire, is probably the least known trail system in Antrim County. The 193-acre natural area stretches between the Antrim County Fairgrounds east to Burrel Road and features 1.5 miles of the designated blue ribbon trout stream and 3 miles of trails. Since the late 1990s, Cedar River Natural Area has been a protected and quiet place to soak in the natural world, from wildlife to wildflowers. Some of its trails have been there even longer but who knew? Managed by the Antrim Conservation District, officials readily admit that the preserve, located on the doorstep of Bellaire, is probably the least known trail system in Antrim County. The 193-acre natural area stretches between the Antrim County Fairgrounds east to Burrel Road and features 1.5 miles of the designated blue ribbon trout stream and 3 miles of trails. The trails wind through a variety of habitat, including wetlands, cedar swamps, stands of hemlock, and riparian forest along the Cedar River, and a handful of interpretive signs explain many of them. Three trailheads provide access into the preserve with the Fairground Trailhead, a short walk for campers staying at nearby Craven Park Campground, being the most popular. The description below begins at the Mellon Trailhead, however, and includes all five trails plus backtracking a short distance on the Grade Trail for a 3.2-mile outing that ends at Burrel Road Trailhead. Add another 0.4 mile if you need to walk back to your vehicle off of Stover Road. The natural area makes for an interesting place to hike in spring for wildflower viewing and in October for fall colors while cross-country skiers, mostly locals, take to the trails in the winter. In June and July, the wetlands give rise to enough bugs to require insect repellent. No matter what time of the year you “discover” Cedar River Natural Area, you can quickly revive from an afternoon on the paths at Shorts Brewing Company whose brewpub is just five minutes away in downtown Bellaire. From the Stover Road trailhead, the Mellon Trail begins in a red pine plantation but within a quarter mile enters a cedar swamp and crosses a footbridge over a sluggish stream. Shortly after that you arrive at the junction with Grade Trail, no doubt an old rail bed left over from when Bellaire was a major railroad center in Antrim County in the early 1900s. Head west (left). 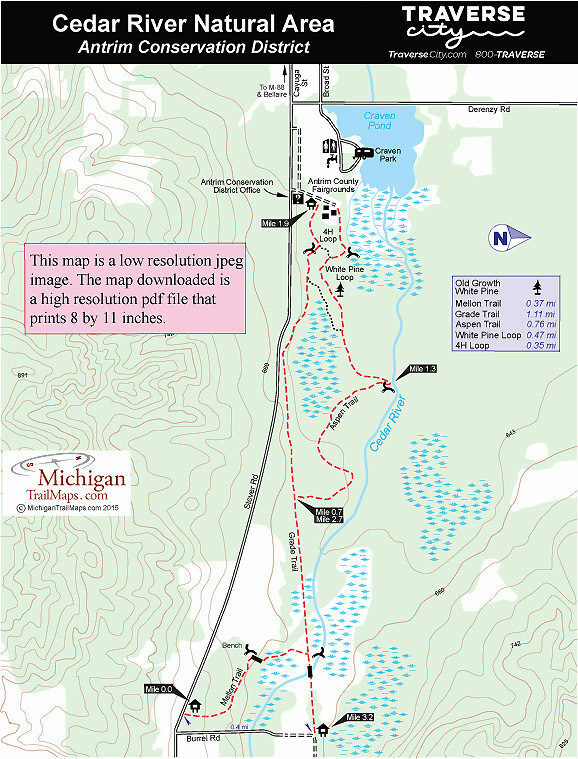 Following the straight and level Grade Trail, you can hear the gurgle and occasionally see the Cedar River before reaching the junction with the Aspen Trail at Mile 0.75. Continue on the Aspen Trail (right) as it winds through a stand of northern white cedar. Segments can be wet in the spring and early summer though the trail was rerouted slightly in 2015 to avoid the deepest mud holes. At Mile 1.3 the trail swings north to reach a bench on the banks of the Cedar River in what many think is the most scenic spot in the preserve. Less than a quarter mile beyond the bench you reach the junction with White Pine Trail. Head west (right) and this loop will take you out of the cedar swamps and into a stand of hemlock. Within a 100 yards you arrive at a giant white pine more than 80 feet tall while next to it is a stump of a pine that at one time stood 120 feet in height. At Mile 1.7 you continue with the 4H Trail that skirts a large wetland before arriving at the Antrim County Fairground. Follow the entrance drive south to the well-posted Fairground Trailhead for the return journey. You quickly return to White Pine Trail and at Mile 2 arrive at a bridge, bench and interpretive display overlooking a wetland. A nice place to take a break if the bugs aren’t out. The junction with Grade Trail is next and you continue east on it, returning to the start of Aspen Trail at Mile 2.7. Stay with the Grade Trail to the Burrel Trailhead, another half mile east. Even if you decided to backtrack Mellon Trail instead, take time to walk to Grade Trail’s footbridge over the Cedar River, a scenic spot that includes a weathered gray barn along the banks. From Burrel Trailhead, it’s a 0.4-mile walk along Burrel Road to Mellon Trailhead. There are no facilities at the Mellon or Burrel Trailheads other than parking and an information display. At the Fairgrounds Trailhead restrooms and drinking are nearby. Overlooking an impoundment of the Cedar River, Carven Park Campground has 30 modern campsites and a handful of primitive sites for tent campers. Sites are available first come-first serve with a self-registration board near the bathhouse. Cedar River Natural Area is open year-round. There are no entry fees for visiting the perserve. 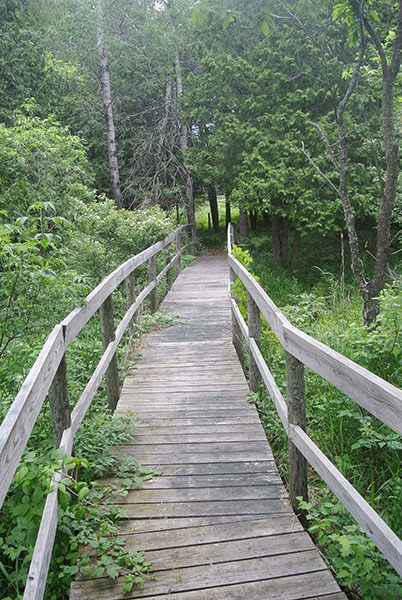 Cedar River Natural Area has three trailheads providing access to the trail system. The Fairground Trailhead is located at the Antrim County Fairgrounds on Stover Road a half mile east of M-88. To reach Mellon Trailhead continue on east on Stover Road for 1.4 miles and look for the natural area sign on the north side of the road 200 feet before the intersection with Burrel Road. Follow Burrel Road 0.4 mile to reach the Burrel Trailhead. 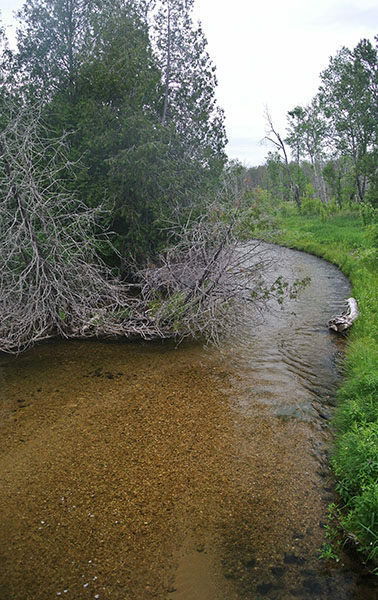 For more information on Cedar River Natural Area contact the Antrim Conservation District (231-533-8363; www.antrimcd.com). For more information about Craven Park contact the Village of Bellaire (231-533-8213; www.bellairemichigan.com).